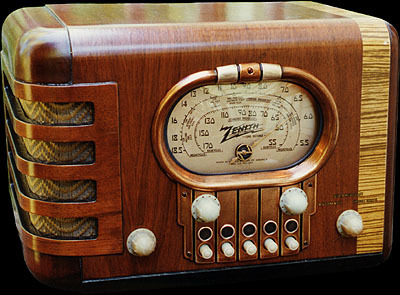 Zenith 5S319, 1939 From a 1939 Zenith brochure. Approximately 12-5/8 inches / 32 cm wide. The grille cloth is not original. 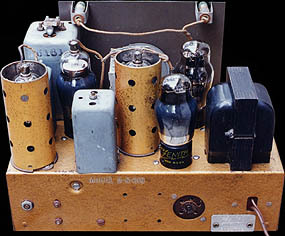 Tube complement: 6A8G mixer/oscillator, 6K7G IF, 6Q7G detector, 6K6G audio output, 6X5G rectifier. 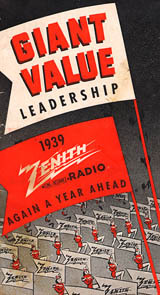 From the very same 1939 Zenith brochure. 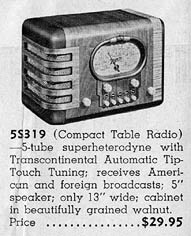 The radio's compact chassis.